I have spent about 0.04% of my life in the city of Portland, but I have to say that it was the most enjoyable 0.04% of my life. I will move to Portland one day or I will die trying.But there are four things that strongly militate against me being a good Portland resident:1. I couldn't grow a full beard if my life depended on it (damn Asian genes!).2. I hate IPAs with a hatred as strong as every other West Coaster's love for that vile liquid.3. I am not now nor have I ever been a Chicago Blackhawks fan (except for the 3 hours I was in On Deck Sports Bar in the Pearl watching the Stanley Cup Finals with a bunch of Hawks fans I didn't know).4. I have no freakin clue how to ride a bicycle.None of this has anything to do with the book, really. Funny book, though. I love this book. There are a bunch of spellcheck and grammarcheck errors, but there are in every book I've read since 2002. It's a quirky enough book that I don't care. That's a first for me; usually errors in publishing make me crazy.This book makes me happy.I'm packing my van.I'll be there soon.Save me some spicy tots, k? If I was developing curriculum on why Portland is so fantastic, this would be required reading. While not a comprehensive commentary on all of the attractions of our fair city, it's a charming little collection of anecdotes and illustrations that had tears of laughter rolling down my cheeks. Could this little volume have benefited from an editor (or at least someone who knows where apostrophes belong and that sentences always begin with capital letters)? Absolutely. But if you're critiquing this book on its literary merits, I daresay you've missed the point and need to reevaluate some of your life choices, loosen up, and just enjoy something for once. As a Portland native, I love This Is Portland for the same reason I like Portlandia: It's funny because it's true. Now, it's not an exhaustive coverage of the city and there are plenty of things that don't appear (same goes for Portlandia), but it's all true. Portland does have a shitload of bikes, beer, and beards. At least two neighbors within a block of my parents' house keep chickens in the backyard. Second-run theaters with beer and pizza are amazing. I love this city and I'm super excited to be going home to it tomorrow for the holidays. This book was really cute and fun, but it was chock full of grammatical errors. Lots of apostrophes where they weren't necessary, missed capitalization at the beginning of sentences, the kinds of things that take me out of the story. However, I moved to Portland recently, and I mostly echo the writer's opinions on the city. He even alerted me to a couple new things to check out, which is great. The illustrations were also super cute, and all in all, I'd say easily worth the $6. This is more of a 2 and a 1/2 star book, not for any fault of its own but simply because it is so slight it's hard to give it too much weight. Mostly, you can just envy that a book of maybe 30 pages of mostly whitespace can end up in the nonfiction bestsellers rack of Powells alongside well-known, top selling authors. Especially since he's a recent Portland transplant with no particular knowledge of the area. On the other hand, it's a breezy pleasant read and I mostly agree with all its points. "Thirteen essays" is a bit misleading, as more than one of these "essays" read something like, "Portland is full of beards." Yes, it is true. I read this. I am not proud. As a consolation, it was really really short. How do I explain, those dark twenty minutes I wasted on this book? Well, let me start by saying I live in Napa. Wine. Nothing. It is a beautiful place, but completely devoid of things to do, places to eat, or normal cultural amenities - at least those that are not grossly inflated for wine country pocketbooks. Sometimes I feel bad about Napa. Often, actually. And I think, Portland - that would be better. At least it doesn’t have L.A.’s smog. Luckily this guy wrote a book, that reminds me that Portland is douchier by the day. Thanks guy. You saved me some trouble. Found this clever, amusing book on the shelf at the Airbnb we stayed at in Portland. I love the author's voice - friendly, funny and at times conspiratorial. His fondness for Portland's charms and quirks is infectious. If I lived here, I just might stalk him in hopes of becoming friends. Examples: the sketch of a 1999 Subaru Legacy, labeled the Portland Escalade. The pizza and beer cinemas. The argument about which ice cream place has a better caramel flavor that can only be settled by going to the other one for a second cone. Cute enough that I was unable to leave it on the shelf at Powell's, I needed to bring it home to install in my guest bedroom. The essay that made me laugh delightedly was the one about Portland traffic, because it was so, so true. It's not the end-all travel guide to Portland, but it'll do in a pinch. Cute little, funny book from a transplant's perspective on Portland. Had some very basic grammatical and spelling errors which could have been fixed fairly simply which makes me think not a lot of effort went into its publication, but hey – it's the Portland way! Full of the typical Portland stereotypes, but as a Portlander myself I can't disagree with any of them. I picked it up at Powell's to browse through it and ended up reading it all. It's pretty funny and spot on. I love this giggly little tome so much, I want to buy it for everyone I know (as well as complete strangers), except that I would be afraid that everyone would move to Portland then and I wouldn't be able to hoard this jewel of a city and keep it secret & safe from the masses. This is a throw away book that tries not to take itself too seriously, but does anyway. If you are a neo-Portlander like myself, you will find parts of it amusing. If you are an old-Portlander, you will probably paper your compost bin with it. Would've really liked it if there weren't so many typos. Very brief, but appropriately so - a great mixture of humor and observation from an outsider, now and insider. 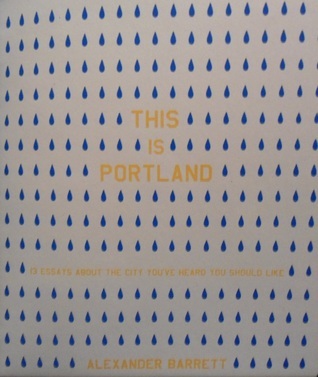 A fun, depthless booklet about Portland from a recent emigrant. It's like a Willamette Week insert for newbies!